‘My own theory, and I cannot emphasize its worthlessness enough, is that chess is fundamentally a theatrical affair. 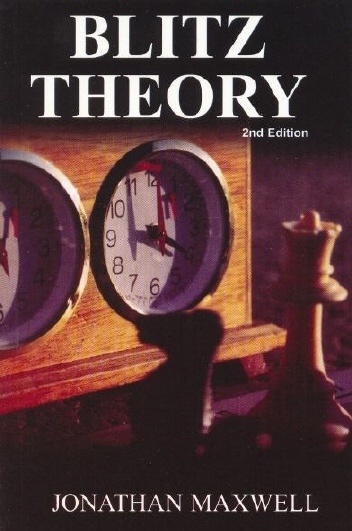 I first became really interested in the game when I heard about the Smyslov Screw. There was a great Russian world champion, who recently enjoyed something of an Indian summer, called Vassily Smyslov, particularly noted as a master of the endgame. Whenever he moved a piece from one square on to another he had a habit of twisting it, as if screwing it into the surface of the board. ‘If we wish to achieve real supremacy in chess we must stress those qualities that have given our drama its greatest strength: the eccentric, the bizarre, the comic, the mannered and the elegant; the same qualities we associate with, say, Stoppard or Olivier. We must at all times refrain from the conventional, the orthodox, the pedestrian and the timid. We need chess equivalents of Alastair Sim, Ralph Richardson, Maggie Smith, Noël Coward, Arthur Lowe and Alan Bennett: absolute mastery, benevolently disguised. In C.N. 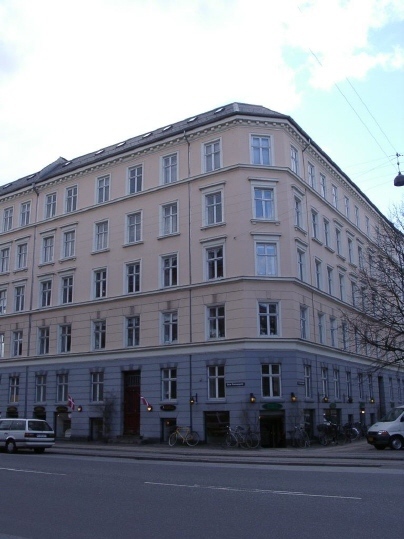 3770 Calle Erlandsson (Lund, Sweden) presented a painting by the Finnish artist Antti Favén (1882-1948), but little progress has yet been made in identifying the players. 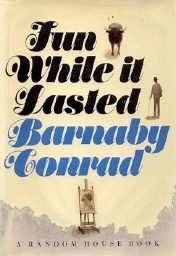 Tarrasch is clearly in the top left-hand corner, and the figure in the centre background, with a cigar, is Marshall. Is Alekhine lighting a cigarette in the centre foreground? 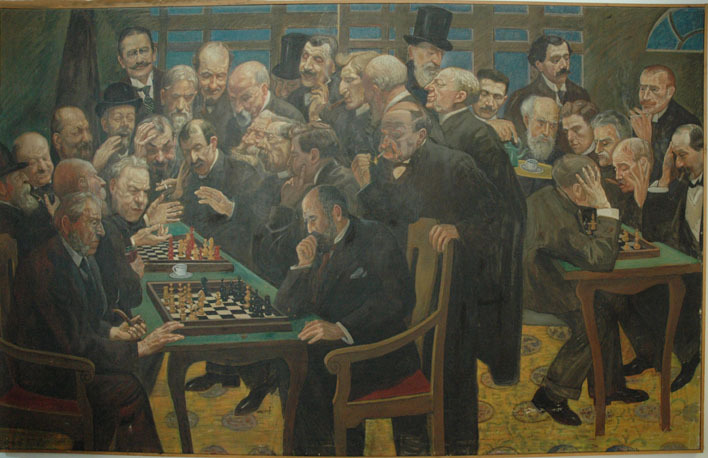 Moreover, Gerhard Josten (Cologne, Germany) suggests that the man seventh from the right is Emanuel Lasker. Since Alekhine became world champion in 1927, this is just another example of Koltanowski’s difficulty with elementary facts. 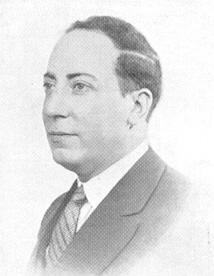 This is Martín (de) Ortueta, whose spectacular loss to Sanz has been widely published and discussed. 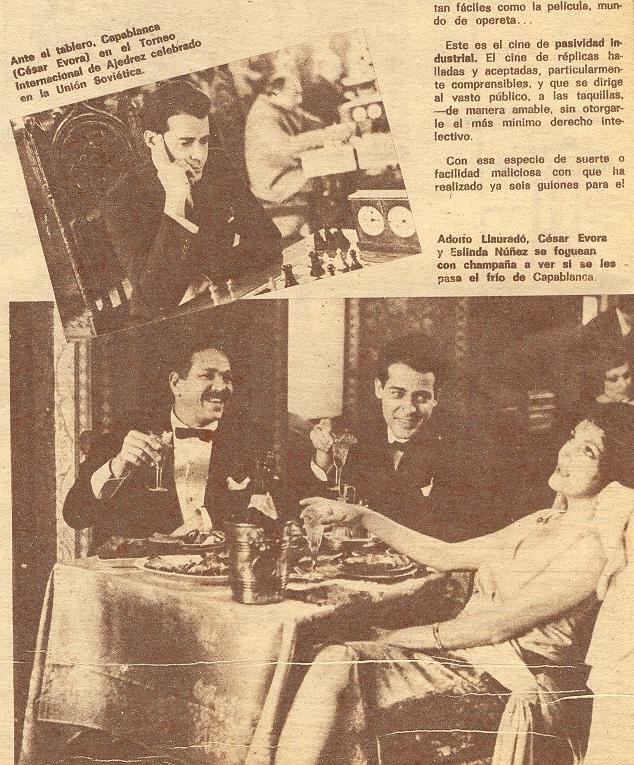 The photograph appeared opposite page 48 of El Ajedrez Español, October 1934. As is well known, Peter Mark Roget, the creator of Roget’s Thesaurus, also came up with ‘The Economic Chess Board’. 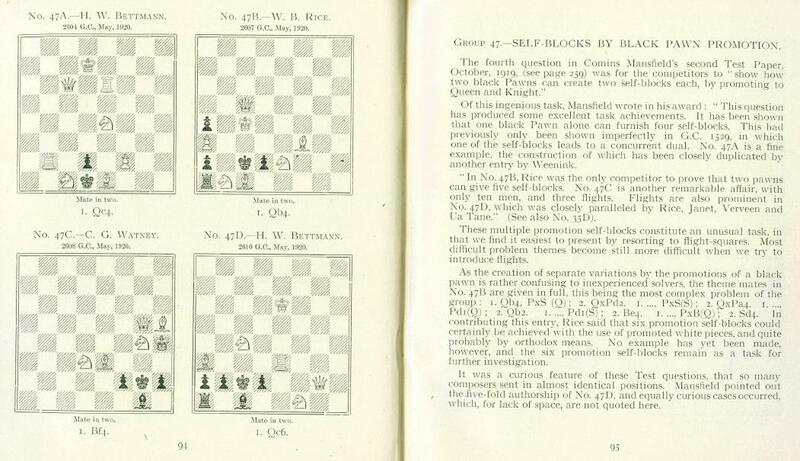 (See, for example, the ‘pocket set’ entry in the various editions of The Oxford Companion to Chess.) 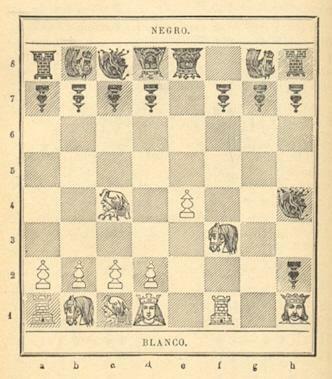 Now, though, Alan McGowan (Waterloo, Canada) points out that Roget was mentioned in The Chess Congress of 1862 by J. Löwenthal (London, 1864) in another connection. 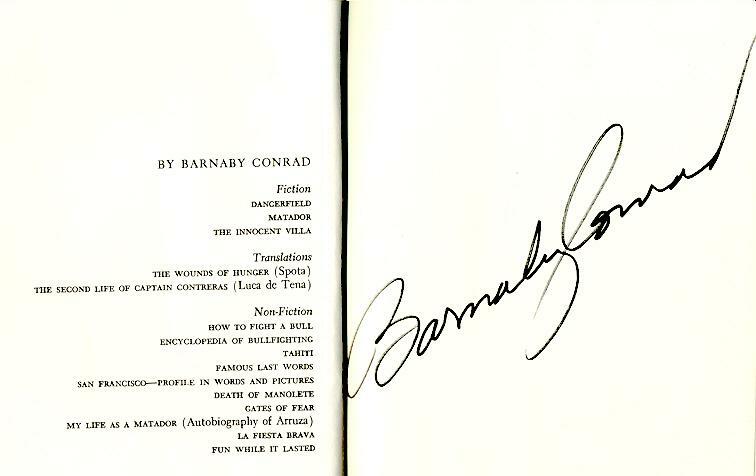 The book contains a selection of problems entered for a competition, and a list of ‘Ordinary Problems’ appears from page lxxviii to page lxxx. 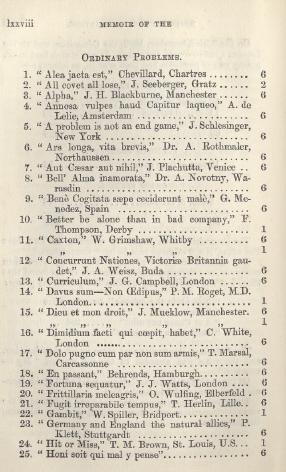 Number 14, on page lxxviii, is ‘Davus sum – Non Oedipus’, P.M. Roget, M.D. London. 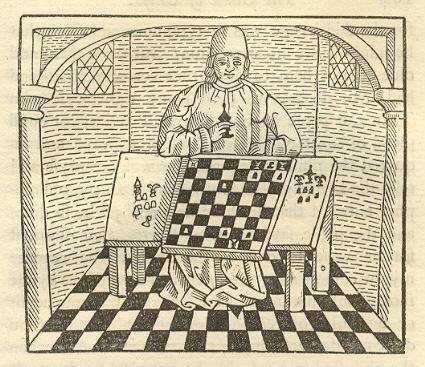 What is known about Roget’s interest in chess problems or in chess in general? What evidence exists that any particular pronunciation of his name infuriated Alekhine? An ipse dixit by Schonberg hardly suffices. 1 e4 e5 2 Nf3 Nc6 3 Bc4 Bc5 4 b4 Bb6 5 c3 Nf6 6 d3 d6 7 Qb3 O-O 8 Bg5 a5 9 b5 a4 10 Qc2 Ne7 11 Bxf6 gxf6 12 h4 Be6 13 Nbd2 d5 14 exd5 Bxd5 15 Bxd5 Nxd5 16 g3 Qd7 17 Ne4 f5 18 Neg5 f6 19 Nh3 Nxc3 20 O-O Nxb5 21 Kh2 Bd4 22 Rac1 c6 23 Ne1 Nc3 24 Qd2 Nd5 25 Nc2 Bb2 26 Rb1 Ba3 (Since this leaves the bishop en prise it may be wondered whether the BCM score was correct.) 27 f4 b5 28 h5 Bd6 29 fxe5 Bxe5 30 d4 Ne7 31 Qe3 Bd6 32 Nf4 Bxf4 33 gxf4 Qd6 34 Rbe1 Rf7 35 Rf2 b4 36 Qf3 Nd5 37 Ne3 Nxe3 38 Qxe3 Raa7 39 Rg2+ Kh8 40 Reg1 Qf8 41 Qe6 Rg7 42 Qxc6 a3 43 Rg3 Rxg3 44 Rxg3 Rg7 45 Qc1 Rxg3 46 Kxg3 Qg8+ 47 Kf2 b3 48 axb3 Qxb3 49 Qe1 a2 50 Qe8+ Kg7 51 Qe7+ Qf7 52 Qa3 Qe6 Drawn. 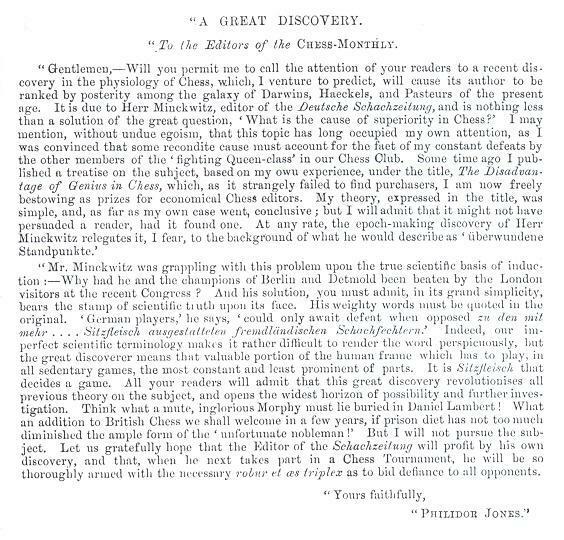 Michael McDowell (Westcliff-on-sea, England) remarks that J. Kling’s The Chess Euclid (London, 1849) included among the list of subscribers ‘Roget, Dr, 18 Upper Bedford Place’. We take the game in question to be Alexander v Botvinnik in the Amsterdam Olympiad of 1954, a Sicilian Defence. ‘Capablanca was a conceited man (i.e. he thought very well of himself) who liked chess because he excelled at it. 25...Qg8 26 f5 Nhxf5 27 gxf5 exf5 28 Ne2 g5 29 Kh1 h6 30 Nf3 f4 31 Kh2 Rg7 32 Rg2 Bf5 33 Rfg1 c6 34 Nxf4 Bxc2 35 Nh5 Rxf3 36 Nxg7 Bg6 37 Qe2 Qf7 38 e6 Qf4+ 39 Kh1 Rxh3+ 40 Rh2 Be4+ 41 Rg2 Qxh2 mate. What is the exact source of this observation? Other/better specimens of such multiple problems will be welcomed. Everything thus clarified, the alphabetically-organized book moves on to a recipe for ‘The best chocolate mousse’. C.N. 2375 (see page 347 of A Chess Omnibus) reported that when annotating his game against Endzelins in the Munich, 1936 Olympiad (which opened 1 d4 Nf6 2 Bg5) Octavio Trompowsky wrote of the bishop move: ‘My variation, which I have been playing for more than 15 years.’ Source: Deutsche Schachblätter, 15 October 1936, page 368. 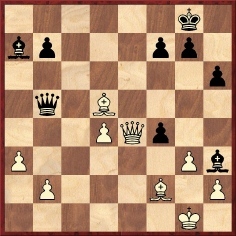 Black to move played 1…Qb5 and White resigned. 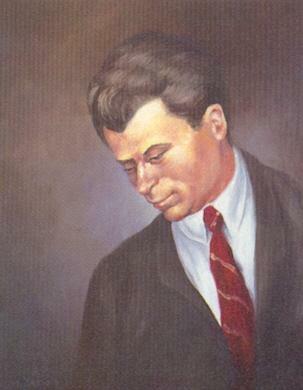 In 1953, 20 years later, Salo Flohr returned to Switzerland, now a full-fledged Russian and as a second to one of the Soviet players competing in the Candidates Tournament in Zurich. We indicated in C.N. 2857 that, in reality, the possibility of Kh1 had been pointed out by almost all magazines which published the game in 1933. 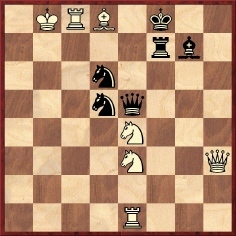 ‘This position constitutes the close of a game played by no less than Salo Flohr (White) against the Swiss player Grob in the 1930s. 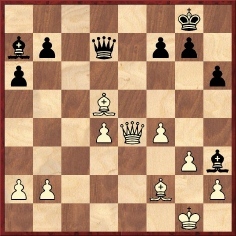 It looks as if Kh1 for White saves the game; and Flohr, under time-pressure, may have missed this. If 1 Kh1 Qf1+ 2 Bg1. Perhaps an opponent can be trusted to find what Russian analysts pointed out a few years later, but which is not terribly hard to see: 2...Bxd4! In answer to this, 3 Qe8+ Kh7 4 Be4+ f5 comes to nothing. Also the sacrifice 3 Bxf7+ can be easily worked out as not leading to a perpetual check. 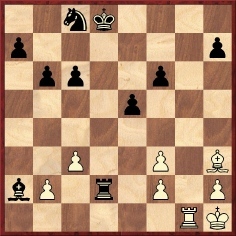 Acceptance of Black’s sacrifice by 3 Qxd4 is answered by 3...f3, which threatens mate. There follows: 4 Bxf7+ Kxf7 5 Qd5+ Kg6! 6 Qe4+ Bf5 wins. Whether this alleged dialogue is any more credible than Koltanowski’s script is unclear, but at least Koltanowski’s book had the correct position, whereas Abrahams put a black, not white, pawn on f4 and gave a different queen’s-side pawn configuration. He was not the first to do so. The conclusion to the game was discussed on pages 99-100 of Der letzte Fehler by Klaus Trautmann (Schwieberdingen, 1999). He related that in 1965 Giorgio Porreca gave the position in L’Italia Scacchistica with a black pawn at f4 (and the incorrect queen’s-side pawns), and that the matter was picked up by Horst Ewald in the 3/1966 issue of Schach. 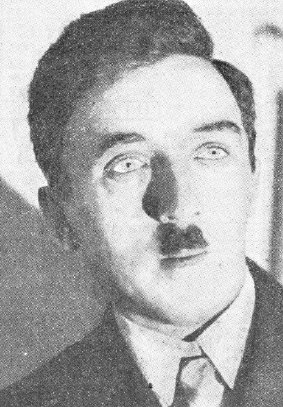 Porreca stated that his source had been a Russian brochure by Boris Wainstein, and much of the discussion involved establishing the correct game-score, a matter not in dispute today. We should, though, like to know when the position first appeared in print as in the second diagram above. It was the opening game in the Flohr v Grob match, played in Arosa, Switzerland from 26 February to 3 March 1933 (Schweizerische Schachzeitung, March 1933, page 37). 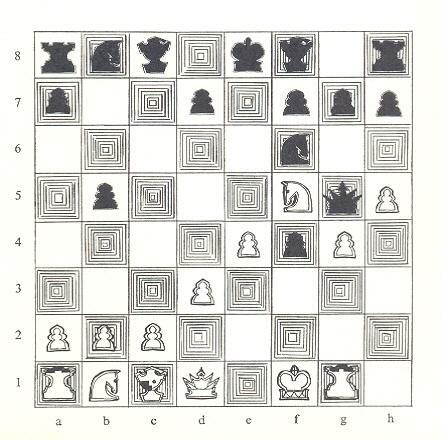 Some later books misdated the game 1932, examples being page 275 of The Joys of Chess by F. Reinfeld (New York, 1961) and page 79 of Blunders and Brilliancies by I. Mullen and M. Moss (Oxford, 1990). ‘The play of a young Russian (aged 17 years), Herr Aleschin, has been attracting considerable notice lately, and it is thought by some good judges that he may occupy the place of the late master Chigorin, in the early future.’ Chess Amateur, February 1909, page 131. ‘M. Alachin, a talented young Russian player.’ Chess Weekly, 24 April 1909, page 176. ‘The world very likely will hear more of A. Alekhin in the near future.’ Chess Weekly, 23 October 1909, page 32. 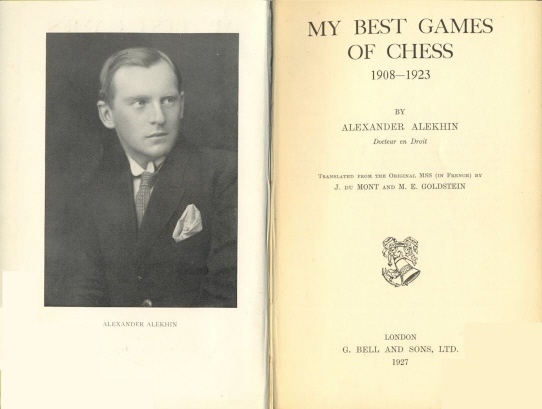 So when was ‘Alekhine’ first seen? Such a question naturally cannot be answered precisely, but that spelling pre-dates all the above quotes. See, for instance, page 289 of the 9 August 1908 issue of Deutsches Wochenschach and page 258 of the August 1908 Deutsche Schachzeitung. 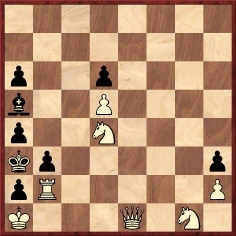 It was also used on page 152 of The Year-Book of Chess, 1909 by E.A. 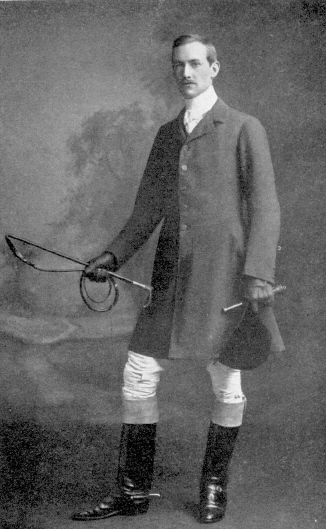 Michell (London, 1909). ‘When we have an obvious check with a rook or queen, we don’t play the check, but instead say “check” while merely cutting the king by placing the piece on the line adjacent to the check. 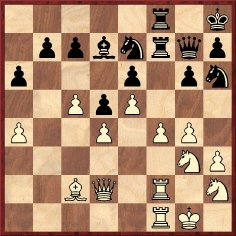 In the above diagram, our opponent will expect the move to be the Rg8 check. Instead, we say “check” while playing the wily Rg7 blitz tactic! Now there is every chance that upon seeing the typical rook thrust he will move out of the anticipated check, and walk right in to our true check. We can then claim his illegal move as our victory. ‘That night I played chess with Mr Lewis before dinner. 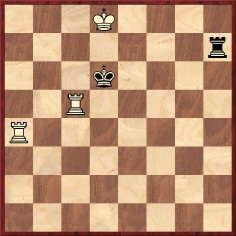 I had studied chess for only a few weeks and had little talent for the game, but I managed to maneuver his king into a bad position fairly soon. I left to go to the bathroom, and when I returned I could swear the pieces had been moved to my disadvantage. But I didn’t say anything and I managed to win anyway. He seemed upset. Then I remembered Marcella’s admonition: “You mustn’t win at chess – not too often, anyway. It’s the most important thing in his day. ... He sat down at the chess table and rubbed his hands with anticipation. He immediately set out to lure me into a Fool’s Mate – to beat me in a minimum of moves. Though it was one of the first maneuvers my instructor had showed me how to avoid, I let myself fall into the trap. C.N. 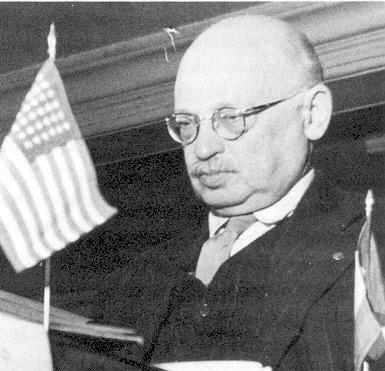 3599 commented, ‘Reinfeld quoted his remark on page 293 of The Treasury of Chess Lore (New York, 1951), but we do not know when he first came up with it’. 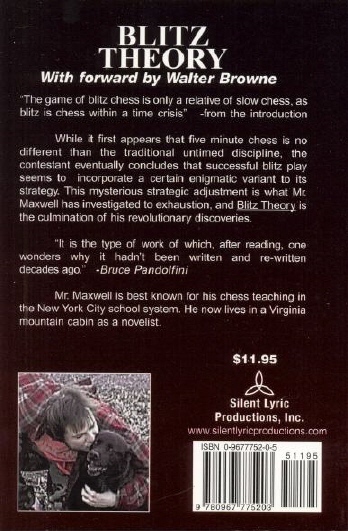 That remains the case, but page 32 of the March 2006 CHESS points out that it was also attributed to Reinfeld when quoted under the chapter heading on page 7 of an earlier work, Winning Chess (co-authored with Irving Chernev). That book was first published in 1948 (not 1949 as stated by CHESS), and the quest continues for any previous appearance of the phrase in Reinfeld’s output. 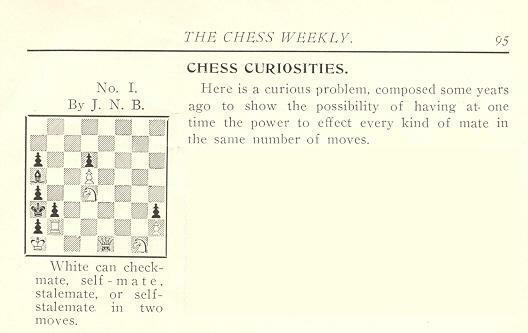 The above comes from page 108 of Reinfeld’s 1941 book Keres’ Best Games of Chess 1931-1940. Its significance is that the first part of the note to White’s 25th move is quoted in the Oxford English Dictionary as the earliest known occurrence of the word Zwischenzug in an English-language text. Readers’ help in looking for older instances will be appreciated. The earliest sighting of Zugzwang in an English-language chess source remains page 166 of the February 1905 issue of Lasker’s Chess Magazine. 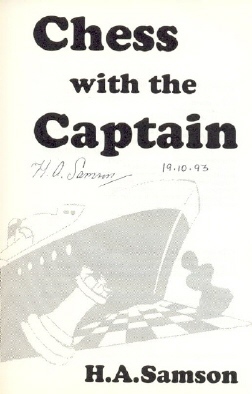 See page 198 of A Chess Omnibus. We are now launching a special feature article, Earliest Occurrences of Chess Terms, the intention being to build up a comprehensive listing of citations from English-language publications. A note at the end of the article explains how readers can assist. As ever, correspondents are requested to provide their full postal address, but some may prefer, in this instance, not to be named publicly if making off-the-cuff suggestions for earliest occurrences. Indeed, for this feature we shall welcome such spontaneous proposals; after all, a start has to be made somewhere in tracking the first appearance of, for instance, ‘blitz chess’. The listing is intentionally making a modest start, and we ask all readers kindly to consider contributing proposals, references, improvements and corrections. 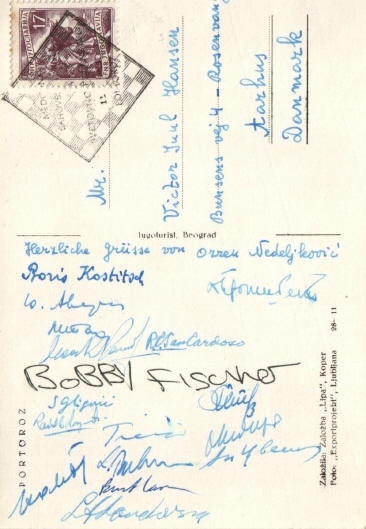 Per Skjoldager (Fredericia, Denmark) recently acquired a postcard signed by a number of masters at Portorož, 1958. 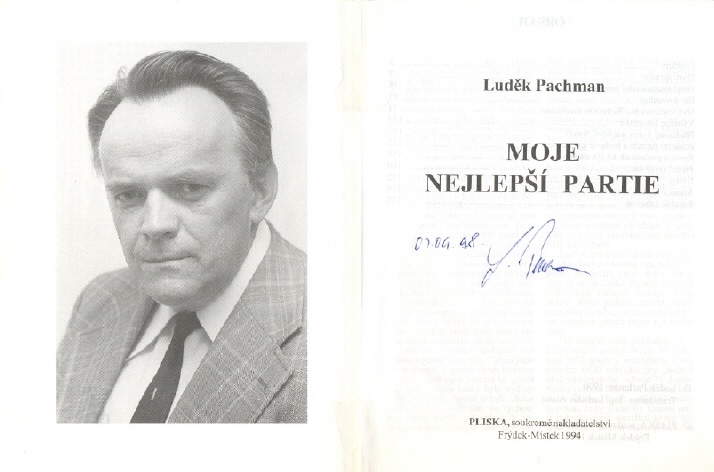 The signatures of Cardoso, Fischer, Gligorić, Kostić, Larsen and Pachman are recognizable, but what about the others? ‘The multiple problem by J.N.B. (i.e. Babson) was published, with a black knight on g1, on page 292 of Brentano’s Chess Monthly, October 1881. I cannot find a solution in any later issue of Volume 1. A number of multiple problems were given in that volume (on, for example, pages 349, 442, 447, 450 and 519). a) Mate in two. b) Stalemate in two. As regards the J.N.B. problem, we note that whereas the 1909 Chess Weekly wrote that it was ‘composed some years ago’, Brentano’s Chess Monthly stated in 1881 that it was ‘composed a long time ago’. C.N.s 3686 and 4011 reported that Everyman Chess had announced Rudolph Spielmann Master of Invention by Neil McDonald. The book has now been published, and it is good to see that Rudolph has been duly corrected to Rudolf. C.N. 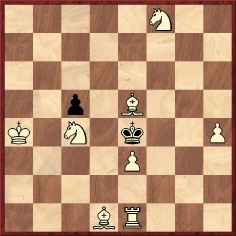 3931 gave a victory attributed to General Tom Thumb on page 216 of Brevity and Brilliancy in Chess by Miron J. Hazeltine (New York, 1866). We noted that the heading was ‘A Mate by General Tom Thumb (At least S. Loyd says it was. )’ and that Loyd was named as the General’s victim. Our correspondent notes that the column is undated, which makes it particularly difficult to identify ‘the Editor of the News’. 1 Rh5, and if 1...Rxh5 2 Ra6+ Kc5 3 Ra5+ ‘e con lo scacco di infilata il Bianco guadagna la Torre’. Whether that remark was made by Tartakower in print we cannot say, but certainly Castello’s proofreading was acknowledged in books by Tartakower and by du Mont. 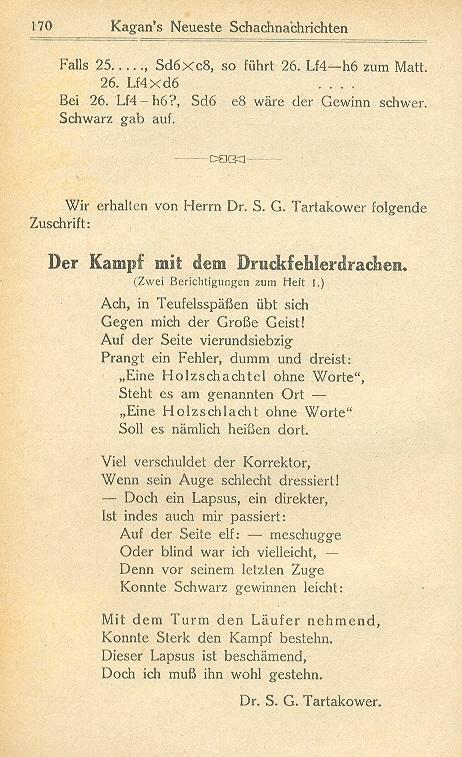 Moreover, Tartakower’s A Breviary of Chess (London, 1937) contained English-language versions by Castello of a number of short poems (‘quatrains’) by Jules Lazard. Available on-line at various websites, they are well worth reading, in both French and English. 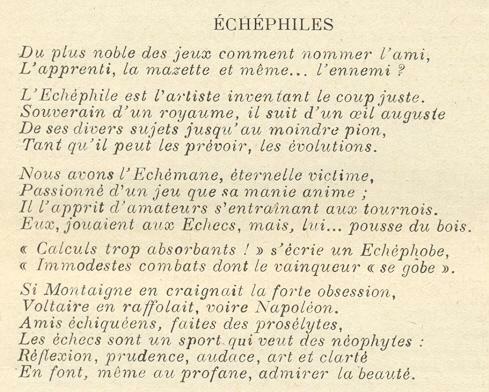 ‘Echéphiles – Amis du noble jeu. Echémanes – Ceux qui le jouent sans trop le connaître, qui jouent avec les échecs et non aux échecs. 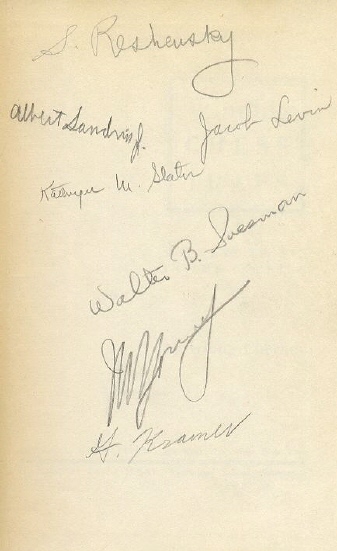 Page 264 of the first edition of Tartakower’s A Breviary of Chess named three politicians ‘amongst public men of our time who are keenly interested in the game’: Bonar Law, Sir John Simon and Leslie Burgin. Burgin is all but forgotten nowadays, and even in the 1930s he was not exactly a high-flying minister in the British Government. 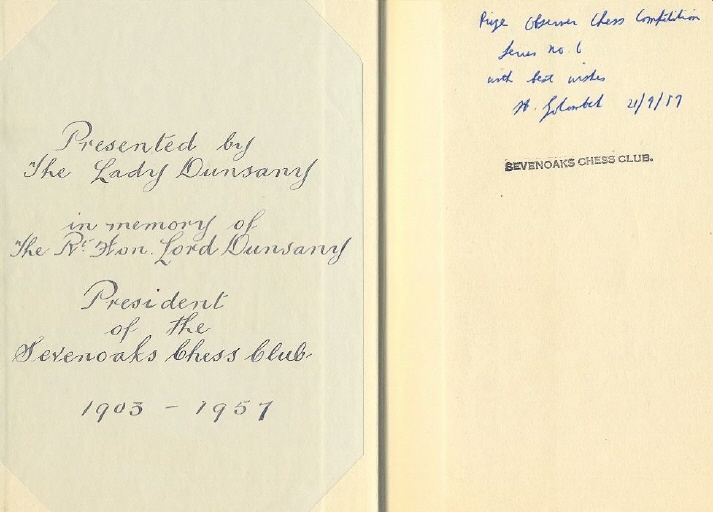 J. du Mont dedicated The Basis of Combination in Chess (London, 1938) ‘to my friend Leslie Burgin’. A number of C.N. items (see pages 330-332 of Chess Facts and Fables) investigated the origins of the well-known saying ‘the threat is stronger than the execution’. Our starting-point was a book which attributed it to Tartakower, but eventually it was traced back, via Nimzowitsch and Mason, to Karl Eisenbach (1836-1894). The source for that was a report by Marco (found by our correspondent Peter Anderberg) on page 111 of the March-April 1908 Wiener Schachzeitung. All that we can currently add is that in a list of ‘maxims and advice’ on page 229 of A Breviary of Chess Tartakower included ‘A threat is more powerful than its execution’, and attributed it to Tarrasch. a) How many webpages have the quote? b) How many webpages have it with a source? Can readers improve on past efforts to find the earliest instances of moves being awarded exclamation and question marks (see page 116 of Chess Explorations)? In C.N. 647 another correspondent, Rob Verhoeven, pointed out that page 6 of Cook’s 1874 book Synopsis of the Chess Openings gave a list of abbreviations which included =, ! 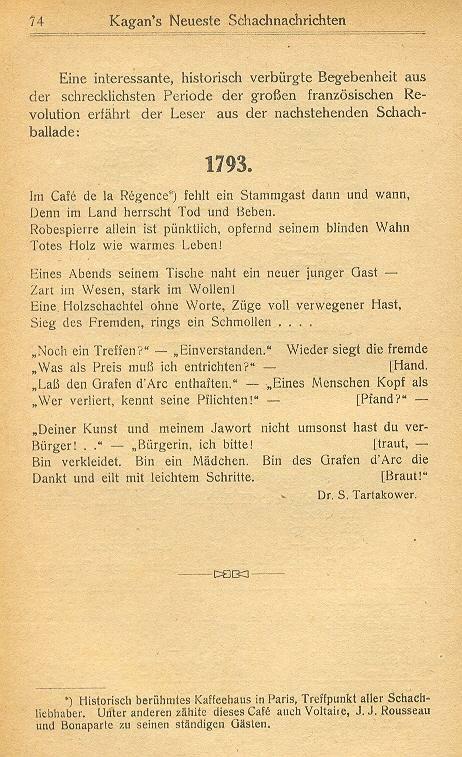 and ?, whereas Lange’s Jahrbuch des Westdeutschen Schachbundes 1862 used (!) and (?). Mention of G.H. 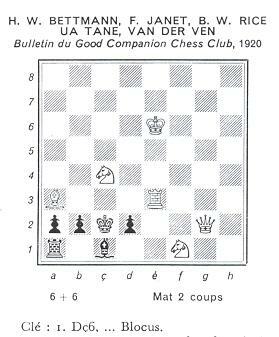 Diggle prompts us to give another of his articles, from page 5 of volume one of Chess Characters (Geneva, 1984). Entitled ‘Tartakower saves the day’, it was originally published in the March 1975 Newsflash. As usual, Diggle referred to himself in the third person, as ‘the Badmaster’. ‘Towards the end of the War, the Badmaster (then stationed at an RAOC Depot in London) went along to the Lud-Eagle Chess Club to watch a friendly match between the Club and the “Combined Forces”. 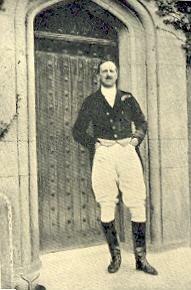 Playing top board for the latter was the renowned Tartakower (then known as Lieut. Cartier of the FFF). In those uncertain days picking a “Forces” Team was a precarious operation; sudden unavoidable absence was rife – substitutes had to be roped in at a moment’s notice – and “fools who came to watch remained to play”. Thus the BM found himself in the match, playing White against an opponent about a class and a half stronger than himself. But luckily the time for play was rather short; and at adjudication time the BM was only a pawn down – his remaining pieces, though wretchedly deployed, were still in the shop window. His courteous and easy-going opponent did not immediately proceed to demonstrate a dozen ways of winning, but merely said, “Oh, well, let the bright boys have a look at it” (though there were not so many “boys” brighter than himself present). When the “bright boys” arrived, they swore to a man that the Badmaster had “had it”. But the result of the match depended on this game, and someone suggested – “Let Cartier have a look at it”. The Great Master, having been fetched, sat down at the board very simply and unaffectedly, and drank in through his spectacles the fruits (and probably the whole deplorable history) of the BM’s afternoon strategy. First he shook his head in silence, but presently (like Dr Johnson) he was perceived to be “rolling himself, as about to speak”, and sentence might well have been instantly pronounced, when the BM was unexpectedly saved by the gong. The setting of 47D is very light, so it is not surprising that five composers should have come up with similar settings. 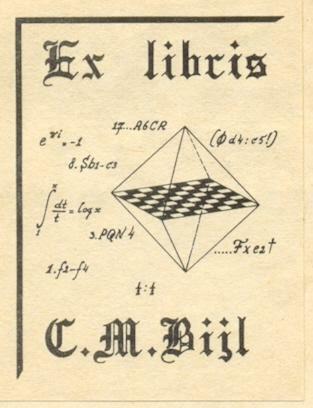 I checked with the librarian of the British Chess Problem Society, John Beasley, and only the Bettmann setting was published in Our Folder for May 1920. The text in The Good Companion Two-Mover is practically identical to that in the Folder. If the Dictionnaire des échecs is suggesting that the five composers submitted identical settings, I think that is incorrect. The settings probably differed only in very slight respects, e.g. one or two pieces starting on different squares, but if any had been identical to Bettmann’s I am sure the composer would have been acknowledged above the diagram. Probably Bettmann’s setting was selected for a diagram because it was considered to have the best key, or the neatest appearance, but it is impossible to tell without seeing the other versions. Averbakh (below Kostić) and Tal (below Averbakh). 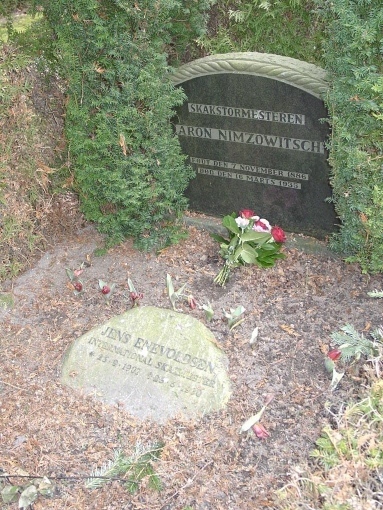 To the right of Kostić: Bronstein. Below Gligorić: Sanguineti. 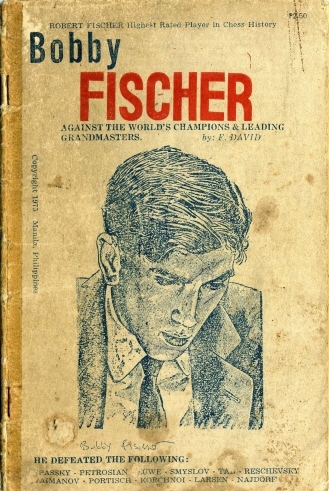 Below the word ‘Fischer’: Petrosian. ‘There are plenty of examples of exclamation marks in the BCM of 1881 before page 124. They start on page 23, where there is a note at the bottom of the page stating,“This sign (!) denotes ‘best move’”. 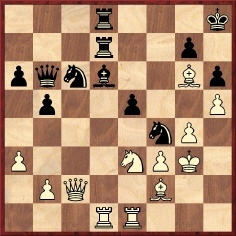 The game between Wayte and Schmid on page 24 has exclamation marks for three moves in a row. 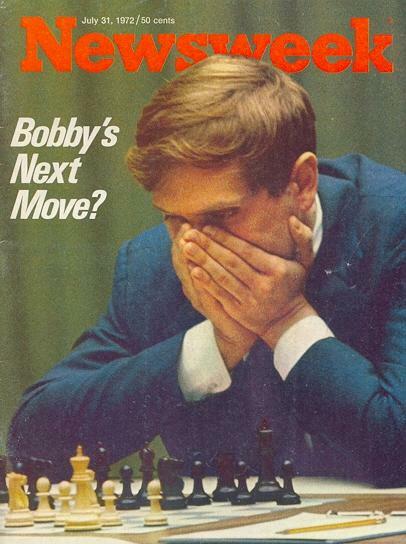 An easier question than usual: name any players who, when barely into their teens, had already had two chess books dedicated to them. ‘Geoffrey Harber Diggle (born in Moulton, Lincolnshire on 6 December 1902) died in Brighton on 13 February 1993. Affectionately christened the Badmaster by C.H.O’D. 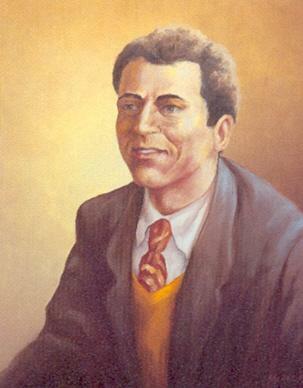 Alexander (who also described him as “one of the best writers on chess that I know”), G.H.D. contributed many fine articles to the BCM (1933-1981) and the BCF’s Newsflash and Chess Moves (1974-1992).